If you want to know what turtles eat, there are several types of turtles you could own as a pet including aquatic turtles like red-eared sliders, box turtles and tortoises. Since each of one has different dietary needs, make sure you choose from the right turtle food list below. What do turtles eat? Depending on the species, turtles can be herbivores (eating only plants), carnivores (eating only meat), or omnivores (eating both plants and meat). Pet stores offer a range of turtle food products in pellets, sticks, and chunks, formulated for different types of turtles and providing balanced nutrition with appropriate vitamins and minerals to keep the turtles healthy. However, this type of bland food is not the only thing turtles can eat, and it can be healthier and less expensive to offer turtles a range of fresh foods. In addition to a range of foods and pet store supplements, offering pet turtles an additional source of calcium - necessary for a strong, healthy shell - is also a good idea. Crushed eggshells, oyster shells, and cuttlebone are all fantastic calcium sources that you can add to your turtle's diet on a regular basis. Avoid offering turtles any dairy products such as milk, yogurt, or cheese. They cannot digest dairy, and it will cause illness. Offer protein sources only every two to three days to avoid too much protein in the turtle's diet. Avoid raw meat or hamburger as it may become tainted and rotten before the turtle eats it. Avoid manufactured foods, such as crackers or bread, which may have ingredients that don't support your turtle's health. Offer foods in small pieces that are easier for the turtle to eat, especially baby turtles. Turtles do not have teeth and use their jaws to cut food into bite-sized pieces. 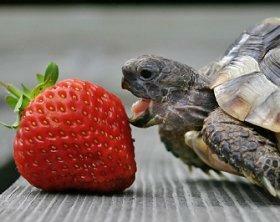 Fresh foods are best; do not leave food in a turtle's tank or cage where it can mold or rot. Always clean the food dish before adding another serving. What Do Turtles Eat for Food in the Wild? Turtles who live in the wild are like most other reptiles; they eat whatever they come across. A turtle's diet ranges depending on regional factors and whatever it has access to within its habitat. Aquatic turtles and land turtles have different diets. What Do Aquatic (Water or Lake) Turtles Eat? Larger aquatic turtles, such as snapping turtles, may eat ducks or other birds who are resting on the water's surface. 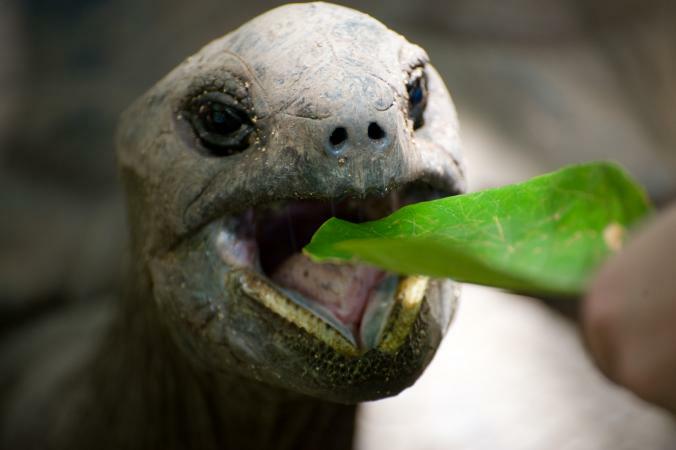 What Do Land Turtles Eat in the Wild? Pet turtles can eat a wide range of foods, from small insects, to fruits and vegetables, to flowers. Therefore, owners need to offer a widely varied, balanced diet to keep a pet turtle healthy and happy. By choosing different foods and feeding the turtle well, including adding pet store supplements to ensure enough vitamins and minerals, a pet turtle can live a long and well-fed life.